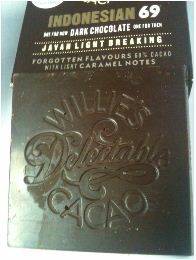 I was lucky enough to receive as a gift some of the lovely Willie’s chocolate from Dom. This chocolate was made famous through the Channel 4 documentary following Willie and his journey to making the best chocolate possible, in the best way. 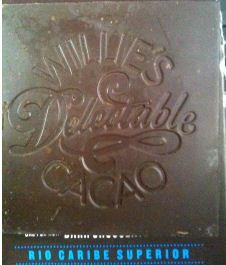 Few chocolate companies, I’d gamble, would open up their operations to the kind of scrutiny Willie did and as a result you can be assured that from start to finish, you’re not just getting something special from Willie, you’re getting something personal. There are organic, ethical, rainforest alliance, fair trade, and other chocolates on the market who mainly trade on the ethics. 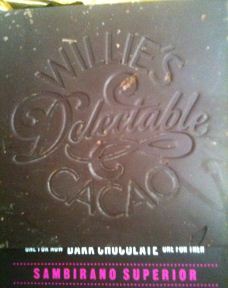 Willie just makes an awesome product and lets the chocolate stand for itself. He has a wide range and I must admit I found myself jealously guarding a number of these bars as they were delightful. Indonesian 69 – This bar was the first I tried. I have a bit of a love affair with Indonesian chocolate and I wanted to try this iteration. There isn’t a lot of chocolate coming out of Indonesia but what does come out can be made terrifically. The initial flavour is of unadulterated dark chocolate like a brownie but with a slight acidity. The fruitiness takes time to develop and instead of being red fruits it almost tastes like apricots. I think that the finish is clean with lingering brownie notes with an occasional fruit popping through. Peruvian 70 – I decided that since I started with the 69, I’d go up in small steps and so went for the 70% next. Now, many of you know that percentage is no indicator of quality and yet here it is more of a scale. This is a different region and so I tried it at a different time (always in the morning). Here I got an initial flavour of earth with I think a slight leather hint but with some acidity coming through. It takes a bit but I’m getting dried red fruit and I think maybe a hint of tropical fruits! 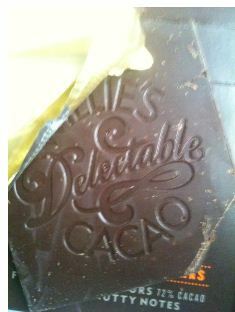 This chocolate, in my opinion, finishes clean with very little lingering flavour. Madagascan 71 – now we’re going up the numbers I might as well take a trip to the 71% Madagascan. I’m a huge fan of this region and the beans some of the producers are creating. I’m a massive fan of the wonderful fruit and distinct acidity you can get in these beans. So when I opened the foil and released the scent of chocolate and mixed ripe red berries, I knew I was in for a treat – but |I also knew the Rio Caribe was yet to come. The initial flavour of fruit is joined with a sharp acidity as the very first thing you get. I was then surprised a bit as an earthy chocolate flavour developed in my mouth. I’m not a fan of that dark, almost drying sensation but I was willing to stick with it. The subtle flavours of fruit keep poking their way through the melt but I’m moving it around a lot in my mouth to get it – pushing it to the front of my tongue to let it melt there to capture the fruit and acidity. I feel that this bar finishes light and clean and doesn’t leave you feeling like you still have chocolate in your mouth. Venezuelan 72 Hacienda – Ah this bar and the Rio Caribe fought to be next in line in my mind but in the spirit of sophrosyne and of always saving the best for last, I ventured one morning into this bar’s soft card encasement to reveal the foil airtight envelopes within. That first scent when I opened it was quintessential chocolate and this one I did share and it was enjoyed above others I had shared. This chocolate was nutty from beginning. 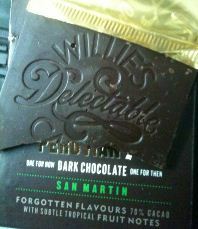 Not a huge favourite for me but the dark intense chocolate undertone was actually enhanced by the nuttiness. The flavour was stable and there was no real acidity – that feeling in your cheeks of something sharp here was an almost earthy finish with a long lingering mouth coating for long lasting notes of deep dark chocolate on the palette. Perfect dieter chocolate as you get the taste of chocolate for longer. Venezuelan 72 Rio Caribe – This was it. The ultimate bar and the one I had been waiting for. I’ve had other Rio Caribe before but this was Willie’s and I was eager to see how he had treated the bean and what he had been able to get out of it. So it was with no small amount of anticipation that I opened the foil and breathed in the heady scent of a rich, complex chocolate. There was intense fruit from initial melt which was also smooth. The flavour gave an unexpected hint of tanned leather or possibly dried tobacco leaves. I’m not a fan but the tobacco lends an almost burnt flavour to bar and yet not. I’ve had bars where the beans were burnt and this is, instead, quite robust and complex. There is a fast, clean finish, with not much lingering flavour after the piece is gone. Not quite what I was expecting but still a top notch chocolate. All of Willie’s bars are ones I’d buy. In fact I’ve already asked Santa for more for Christmas and if I’m really lucky perhaps I’ll get to visit Willie’s chocolate factory. The mouth feel is distinct and the flavours have been well developed. The tempering is great (I’ve seen bars with bloom at the pour) and the moulding is fine. All in all this is clearly an artisan bar with great taste and excellent credentials. Where I was extremely sceptical before, I stand corrected. Mm they all look quite nice, i quite like the sound of the madagascar one. This chocolate is a taste delight. Hmm, interesting. I’ve never heard of Willie’s before, but I love all the variation in geographic region with little variation in percentages. I’d love to see more offerings such as this of differing beans from nearby regions (like the Hacienda and Rio Caribe) – I think that’s a great way to highlight the flavor profiles. Just tried the Indonesian 69 – absolutely delicious and well worth the money! You only need a little as it’s so intense.